Andrei Bely's novel Petersburg is considered one of the four greatest prose masterpieces of the 20th century. In this new edition of the best-selling translation, the reader will have access to the translators' detailed commentary, which provides the necessary historical and literary context for understanding the novel, as well as a foreword by Olga Matich, acclaimed scholar of Russian literature. 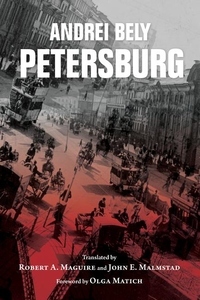 Set in 1905 in St. Petersburg, a city in the throes of sociopolitical conflict, the novel follows university student Nikolai Apollonovich Ableukhov, who has gotten entangled with a revolutionary terrorist organization with plans to assassinate a government official-Nikolai's own father, Apollon Apollonovich Ableukhov. With a sprawling cast of characters, set against a nightmarish city, it is all at once a historical, political, philosophical, and darkly comedic novel.